For any modern Orthodox pilgrim and ordinary tourist, village’s name Teryaevo will probably not tell much, because the spiritual gem of these places - the ancient Monastery of St. Joseph - got the name from the name of the local princeland – Volokolamsk’s monastery. 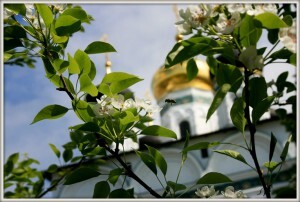 Many sincerely believe that the monastery is located in the town of Volokolamsk. St. Joseph found what he was looking for. Being in the woods, away from the cities and roadway paths to gather here the brotherhood in a name of Christ and find the ideal of monastic service. By this day, little alien pilgrims going during the week under the roof of the temple. Church and secluded pray, works of obedience, inspirational reading and caring for spiritual enlightenment - so, monastery monks try in the quiet a little closer to the covenants that Reverend Abbot monks left like the last will. Now Joseph Volokolamsk Monastery - the connection of monastic traditions, and at the same time - a living testimony of the historical events, the ensemble of original and in many ways unique monuments of architecture and art. Nature itself awakens in the soul sensitive traveler distinctive spiritual harmony, which can not be found in the monasteries of the Russian capital and the Moscow region. They come here to unite with the main shrines of the region - the relics of St Joseph and icon of the Mother of God, to learn about the ancestors who fled in the region over the centuries, the cathedral, of which is crowned in the twentieth century and the New Russian Martyr feat Nile (Tutukin). Tourist’s Office offers one-half hour journey to the monastery and introduces architectural monument in the center of which - the majestic Cathedral of the Assumption of the XVII century. His paintings were made in the style of Palekh masters and unsurpassed beauty tiles "Peacock Eye" - a kind of calling card of the monastery. Pilgrims visit the Refectory (the first half of the XVI century). For German’s Tower are stored unique for Russia manuscript library, but most of the former monastery... dungeon, learn about the history of incarceration of St. Maximus the Greek and the deposed Russian King Prince Vasily Shuisky. Relation to the abode of the Russian Grate Princes Vasily III, Ivan the Terrible, Boris Godunov, Peter the Great and the family Gorbachev, the work of Sergei Bondarchuk on the set, "War and Peace", the secret burial Malyuta Skuratov, and, of course, a special page of modern history - revival of the monastery at rector venerable Metropolitan Pitirim of Volokolamsk - tour of the monastery offers a wonderful world of Orthodox monasticism, his selfless service to God and earthly homeland. As in any church, you can buy in the monastery candles and small gifts, remembrance apply for the health and repose in the church bookstore, which is located directly in the existing temple and open daily from early morning until after the evening divine service. At the gate of the monastery is a large church shop, which presented a very diverse range of books, icons and monasteries souvenirs. The shop is open from 11:00 am to 4:30 pm (11:00 – 16:30), and it’s closed on Mondays. Visitors of the monastery have to observe the proper dress code: no shorts, short skirts and open shoulders. In autumn and winter seasons it is recommended to be dressed as warmly as possible, because in Volokolamsk district it’s always colder than Moscow. On your way to the monastery you will have a chance to admire huge monastery ponds. These man-made ponds – of particular concern to the brethren, moreover, they are protected by the state, and some species of birds nesting in the World “Red” Book found their inhibitors around this area. Remember to clean and respect the nature, if you have a desire to spend some time around the ponds. Abode is located in the village of Teryaevo, Volokolamsk town, Moscow Region. The distance from the Moscow to the monastery on the “New Riga highway” through station Chismena is 110 km. - By car on the “New Riga highway”, a 98-kilometer you want to turn right in the direction of the station Chismena. Passing the w / e move, then go to Teryaevo, drive round the village and monastery pond. Starting from the “New Riga highway”, at every intersection there are signs "Joseph Volotsky monastery" (Russian – «Иосифо-Волоцкий монастырь»). - By public transport from the metro “Tushinskaya” (Тушинская, Moscow) - bus to Volokolamsk town or train to the station Chismena (Чисмена). In the town at the bus station or at the station Chismena change for the next bus to village of Teryaevo (Теряево). On weekends, the monastery has a small cafe. There you can buy tea, coffee, pastries, honey, and dairy products (made in the monastery). It is open on Saturdays, Sundays and major church holidays from 11:00 am to 3:00 pm (11:00 – 15:00). Order excursions have to be requested in advance. Organizers of the trip must forewarn TOURIST’S OFFICE to change the dates of arrival to the monastery. Visitors arriving without prior notice, to conduct tours may be denied. When planning the trip, you need to remember that the monastery was not in a position to offer the pilgrims hot meals and overnight stay. Multiple coaches should not be left directly at the walls of the monastery; they must be parked on a special bus parking lot. The lot is located within one hundred meters before reaching the gates of the monastery and marked by special road signs "for the tour buses." Visitors to the monastery to observe the proper dress code: no shorts, short skirts and open shoulders. In autumn and winter season is recommended to be dressed as warmly as possible, because it is always colder in Volokolamsk than Moscow. On arrival to the monastery, the group needs to wait for the guide in the nearby gazebo. Excursions can only be guided by the monastery’s attendance. It’s very important for us to know how much you liked the tour. Please don’t hesitate to express your positive gratitude to the guides in the end of the excursion. We would really appreciate if you could leave for us a short message with your impression regarding the trip. What did you like most? What do you think can be improved or changed? Maybe you would like to see some kind of souvenirs? Please don’t hesitate to leave any of this information in your comments. Also such notes can be used to share your experience with other people who haven’t visited our monastery yet. In this case your commentary will help others to know what to expect.